Photojournalist James Foley was a fearless advocate for the oppressed and voiceless victims of the carnage in the Middle East until he became a victim himself. Photo courtesy HBO. Given the nature of Jim Foley’s work and the barbarity of his murder, I approached this film with some trepidation and one burning question. Why did Foley and others like him, including a surprising number of women, continue to be drawn like a moth to a flame to this exceedingly dangerous line of work, especially as freelancers with no financial security. Jim: The James Foley Story does a good job of answering that question. Former projects by Brian Oakes include the outstanding Living with Lincoln, which Oakes co-directed with Peter Kunhardt, and I previously reviewed in FrontRowCenter http://www.judithtrojan.com/2015/04/13. Members of the Kunhardt family– producers George and Teddy Kunhardt with Eva Lipman, and executive producer Peter Kunhardt— also worked with Oakes on Jim. Oakes, a childhood friend of Jim Foley’s, sets his primary focus on Foley’s immediate family. His mom, dad, sister and three brothers are caring, if conflicted witnesses to Jim’s journey from their bucolic New Hampshire home to the bleak killing fields of Syria. Their perceptions of Jim, while loving and deeply respectful, are also admittedly painful to articulate. They’re haunted by the memory of his gruesome death and their Sisyphean efforts to broker his release from captivity. James Foley on November 5, 2012, in the Karm Jebel neighborhood of Aleppo, Syria, that was being heavily fought over. He was kidnapped weeks later on Thanksgiving, held in captivity at undisclosed locations and killed two years later. Photo: Nicole Tung. Courtesy HBO. Foley showed early talent for teaching, writing and social service, but it wasn’t until he ventured into photojournalism abroad that those talents coalesced into his true calling. Fellow photojournalists reveal much about the psychology of their profession and their admiration for their friend’s fearless determination to expose the tragic reality of civilian casualties. The juxtaposition of Jim’s graphic frontline photos and footage with playful Foley family photos and home movies makes for startling counterpoint throughout this film. The international hostages with whom Foley shared the final portion of his two-year captivity are also extremely important to this story. They graphically recall the atrocities they all faced at the hands of their ISIS captors, but most especially Foley who seemed to be singled out for the worst of it. Their memories, enhanced by some artfully filmed reenactments, are painful reminders of the inhumanity that drives ISIS. When Danish journalist and fellow hostage Daniel Rye Ottosen was rumored to be released, Jim asked him to pass a letter home to his family and friends. Ottosen committed it to memory and shared it with Foley’s mom upon his release. “Eighteen of us have been held together in one cell, which has helped me. … We are so grateful when anyone is freed; but of course, yearn for our own freedom. 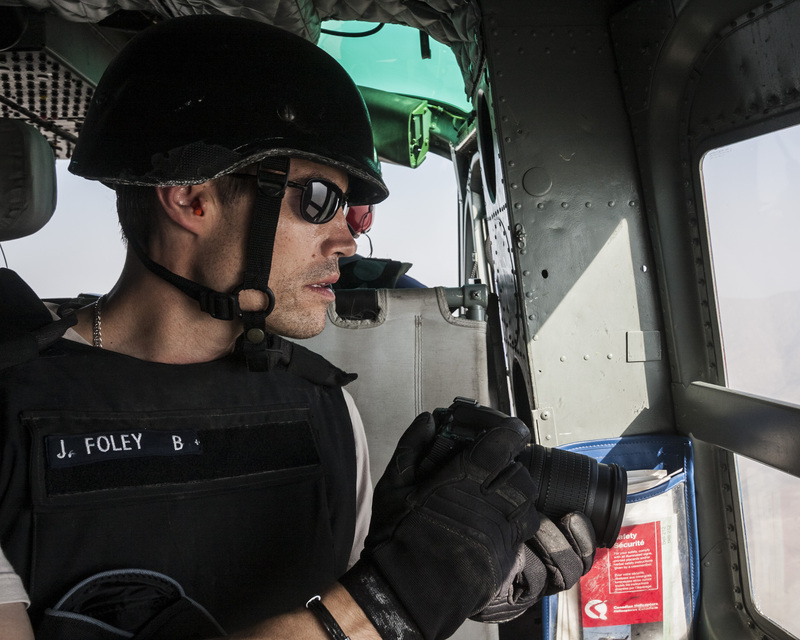 We try to encourage each other and share strength.”–James Foley, from his final “letter” home. 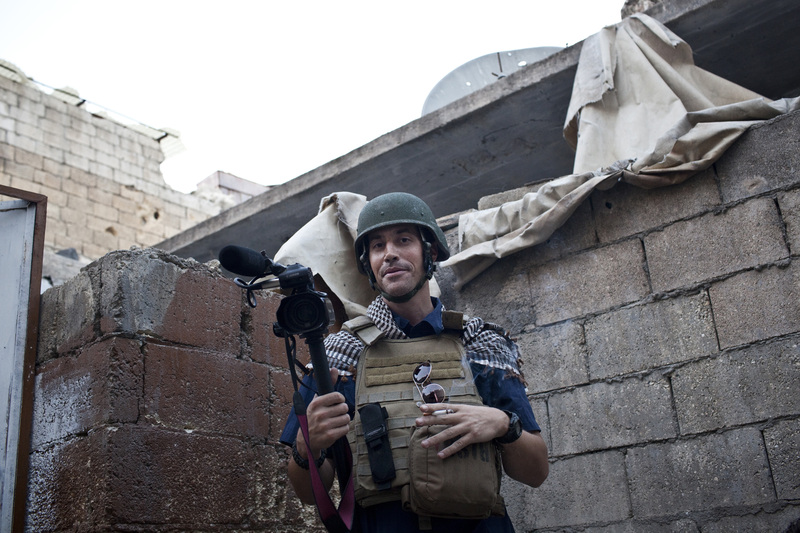 Thankfully, Jim: The James Foley Story does not include the infamous video of his public execution. It closes instead with an original song, “The Empty Chair,” sung by Sting who co-wrote it with J. Ralph. The film is a powerful reminder of the resilience of the human spirit in the face of gross inhumanity… and the importance of family, friends and prayer in our life’s journey. 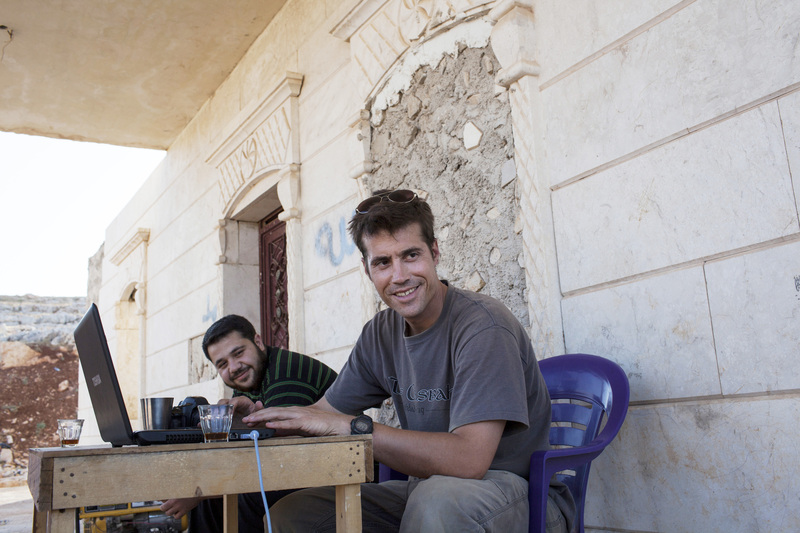 James Foley doing what he did best…reporting from Syria in 2012. Photo: Nicole Tung. Courtesy HBO. James Foley’s legacy serves as a wake-up call to lend our voices and our talents to exposing the victimization of others, whether it be in our neighborhoods, across our country, or wherever tyranny hangs its evil hat. This entry was posted in Cable, Film, Journalism, Photography and tagged Brian Oakes, Daniel Rye Ottosen, Death & Dying, Family Relationships, HBO, Hostage Negotiations, James W. Foley, Jim: The James Foley Story, Middle East, Peter Kunhardt, Photojournalism, Sundance Film Festival, Terrorism. Bookmark the permalink. Thanks, Don. At least, hopefully now, thanks to this excellent film bio, Jim Foley can be remembered for his inspirational life story and not his horrific murder video. Thank you again Judy, for keeping me in the world with your informative, well written blogs. Thanks so much, Doris! Your support and comments are very much appreciated!